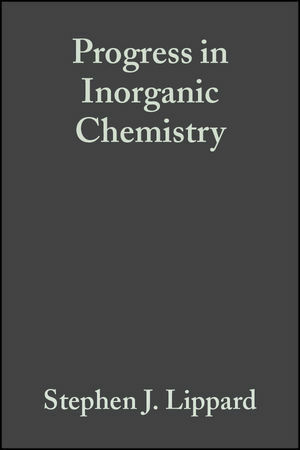 This comprehensive series of volumes on inorganic chemistry provides inorganic chemists with a forum for critical, authoritative evaluations of advances in every area of the discipline. Every volume reports recent progress with a significant, up-to-date selection of papers by internationally recognized researchers, complemented by detailed discussions and complete documentation. Each volume features a complete subject index and the series includes a cumulative index as well. STEPHEN J. LIPPARD is Arthur Noyes Professor in the Department of Chemistry at the Massachusetts Institute of Technology. His recent honors include election to the American Academy of Arts and Sciences in 1986, the 1987 Remson Award of Maryland Section of the ACS, the 1987 ACS Award in Inorganic Chemistry sponsored by the Monsanto Company, a 1988 Humboldt U.S. Senior Scientist Award, and election to the National Academy of Sciences in 1989.